Ireland’s best-known architect Dermot Bannon showcases some of the world’s most amazing homes. 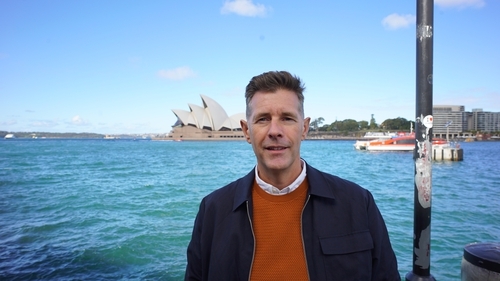 From sunny Sydney to London city, from stylish Melbourne to the snowy landscape of northern Sweden, Dermot explores how people live around the globe in this four part series. In episode 1, Dermot visits the award winning Cabbage Tree House, a stunning home embedded in the hillside of the suburbs of Bayview in Sydney’s Northern Beaches. Designed by Peter Stutchbury, the cave-like house, with its outdoor bath and breath taking views, is home to Jan and Graeme Page. The 200 square metre house sits on 20,000 square metres of rain forest, half of which the owners haven’t got to see yet. "The gardeners come three times a week", Graeme says. "It’s like living in a national park". A family of koala bears, a 3 metre python, lizards and wallabies live in the back garden of Cabbage Tree House. During his visit, Dermot sees the massive staircase Judith built that "you could ride a horse up". He sits with Judith at the dining table that seats 60 people and he, shall we say, drools at the custom made furniture that fills this cathedral like house, including the dog-beds for Judith’s two dogs, Wasabi and Cumin. In Episode 2 of "Dermot Bannon’s Incredible Homes", Dermot visits the ‘cultural capital’ of Australia, Melbourne. Melbourne may not be known for its landmark buildings, yet its architecture is fresh. Walking through the leafy suburb of Brighton, one might be surprised to come across the uncompromising Compound House. From the street, the house reads as a floating pavilion propped up on a sloping landscape. Its copper screen cladding creates fuzzy edges that shimmer in the sunlight. The client, who wanted to stay anonymous, allowed architect Rodney Eggleston to do what he wanted. He requested something polarizing, something different to the streetscape. Exposure of materials was important as well as incorporating systems for the steel industry (the owner works in the steel industry). The architect deliberately removed the fence to allow the house to be viewed. The owners wanted parking for 14 cars, but Rodney insisted that there would be no house left. So he allowed parking for 6! Compound House is architecturally brilliant, having won numerous awards but it’s also a playground for the owners – with a fireman’s pole down to the basement, a swimming pool, space for the million dollar cars and a gym. Research House is owned by the highly regarded architect John Henry and his partner Deb. Built for a modest €160,000, this house is like no other. There are very few walls and five open ‘rooms’. The southern façade is glazed, opening the inside to the bush beyond and elements from the external landscape have been incorporated inside the design, through the use of boulders, a pond and the vast vegetation. John has a passion for the powerful connections between light and space and the dynamic relationship between intersecting floor levels. In response a series of platforms were created to seem to float above the natural terrain below, as well as native shrubs and trees. John also has a ‘condition’ – he cannot stop buying mid century art and furniture. This house has to be seen to be believed, and whilst it took the couple a while to get used to living in a space that has no air conditioning, (in a city where temperatures can reach over 35 degrees), they and Dermot love it. In this episode, Dermot takes a bit of a detour. He has heard of a property in Cape Tribulation, up in Queensland, which he just couldn’t resist. A three hour flight and a four hour drive deep into the Daintree Rainforest, stands Alkira. Designed by Charles Wright, this formidable house stands in its own lake. Its totally off grid, can withstand category 5 hurricanes, and is completely open air, apart from the 6 bedroom pods. Among the build challenges, the swimming pool representing a stylised interpret-ation of the head and shoulders of a famous Aborigine (nicknamed "One Pound Jimmy") featured on two 1950s Australian stamps, is an engineering marvel. Close by is The Great Barrier Reef and all forms of wild life could, if they so choose, wander through the house. This gives Dermot some concern, to say the least. At the heart of the house is a sheltered space consisting of a pool surrounded by garden and then by communal living space. From the air it looks like a lotus flower but from the ground it wouldn’t be out of place in Star Wars. Boneo Country House, designed by architect John Wardle is situated on the Mornington Peninsula, two hours drive from Melbourne. It’s a working farm sitting on 65 acres, looking out over rolling hills, down to the sea. A copper exterior hovers over the landscape, creating spaces that push out towards the water. Melissa Razuki takes Dermot on a tour of her magnificent home. And he is smitten. The design concept of this house is incredibly simple. Three pods shoot off in different directions each offering up one very powerful but controlled view. They focus the eye just like a picture frame. For the final house in the Melbourne episode, Dermot stays on the Mornington Peninsula and travels down to the coast, where he meets architect Robin Williams and his partner, opera singer Donald Cant. Williams and Cant were keen to replace their old, rudimentary beach cottage with a more spacious home that they would look forward to returning to after travelling. The result was Villa Marittima. The 6m-high polycarbonate garage-like door slides back to reveal a concrete floor, angled at a 6.2-degree slope and on which a bed is placed. It’s an unusual choice, but not an arbitrary one. Williams says, ‘I spent a considerable amount of time exploring the sand dunes to find the most comfortable position. I took hundreds of photos to get the comfort factor right. If the ground is too flat, it’s uncomfortable’. In oder to maintain design purity, the architect was keen to conceal almost everything that’s normally associated with a home. The wardrobe and ensuite bathroom, for instance, are hidden behind an internal polycarbonate wall. The kitchen and dining area is just as restrained. Even the kitchen unit, also clad in polycarbonate, recedes into a wall in three parts. The central portion is given over to cooking, while a third component, orientated towards a swimming pool, is perfect for enjoying the morning sunlight. Dermot arrives in Swedish Lapland in the depths of winter. Straightaway, he has to get to grips with the darkness and the severe weather. In the far North the sun doesn’t set at all in June and there is darkness around the clock in January. He discovers that rather than fighting against the darkness and the weather, Swedish design embraces them…and the results are enlightening. First stop is Loggers Lodge, in Harads, Swedish Lapland. Loggrs Lodge is an original timber cabin from 1942. Back then, it housed up to 16 loggers in bunk beds, who cooked and kept warm by its oversized central fireplace. Lying vacant for many years, it was recently renovated and transformed into an eco- getaway, offering guests zero light pollution and uninterrupted views of the Northern lights. The nearest neighbours are 5km away. The lodge is constructed entirely from timber and the exterior is painted in the Swedish traditional falu red paint. The pine interior walls are burnt to emphasize the beautiful pattern in the wood. And there’s the obligatory Swedish sauna and hot tub outside that Dermot can’t resist. The next day, Dermot travels further into Lapland to explore the world famous ‘Tree Hotel’. Complete with seven tree-houses, each one is designed by a different world famous architect. It is an architectural playground and the owner, Britta Lindvall has just let Dermot out to play. He overnights in the 7th Room, designed by Norwegian architects, Snøhetta, – who also designed the Norwegian Opera House. Ten metres up, a net acts as a giant patio, complete with a pine tree growing through it. The terrace adds the fun and the Northern lights add the drama. The room covers 100 sqm of construction space, of which 75 sqm is living space. The beds and seating are dropped 300mm down to offer uninterrupted views. It is built on 14 ultra slim stilt columns so that the imprint on the forest floor is minimal. The entire underside (6th Façade) is a life size photo of the treetops as they looked before the room was put in place. When you lie down underneath, in the spot where the photographer took the picture, the room disappears and it just looks like the woods. No trip would be complete without a trip to the capital for some culture so Dermot heads for Stockholm and takes a tour of the 1430 roomed Royal Palace, built in 1697. From one of the oldest buildings to the newest kid on the block. It’s off to ‘79&Park’, designed by world renowned Danish architect, Bjarke Ingels. This is Ingels first Swedish commission- a daring design of 169 apartments ranging in price from €300k to €1.8m. The apartment size and interiors are modest but it is all about the outdoors here-the shared spaces and roof terraces. Tall apartment blocks are an emerging phenomenon in Stockholm and this one is proving popular with established architects who are snapping them up. Named ‘79&Park’ after the New York style of naming buildings after their street number and their vista- this new address doesn’t disappoint. The "Rock House" has a very scenic and dramatic setting. Set on the edge of a severe hillside, it looks straight over the cliff face and down 15 metres into Lake Mälaren. Originally the owners, Franck and Fredrik Alfvin designed the house to be their summer home but they were thinking about it all the time when they were in Stockholm so they upped sticks and moved here full time and have been living here happily with their two cats for the last 11 years. Rock House was designed by architect Håkan Widjedal,of Arkitektstudio Widjedal Racki. His challenge was to find a flat area to build on, while retaining the ‘marvel’ of the location both inside and out. The solution was to put the house on the edge of the cliff shelf and leave the spot where the old house had been positioned free to provide shelter. Large sliding doors and a series of steps have been added to the front allow you to sit on the back step for maximum shelter. The veranda, facing towards the lake, has a recessed balcony with a roof overhead so it is like a pocket, using the building to protect you from the wind. The Northern Archipelago is a collection of islands north of Stockholm, most of which require a ferry crossing. The area is a popular holiday destination for Stockholmers. Åsa Kallstenius from KOD Architecture describes Sommerhus as ‘Scandinavian holiday home meets Japanese simplicity’. Located on an island, Sommarhus is surrounded by forest and sea. Managing these qualities was central to the design in order to provide the best outlook on the water and the unspoilt nature surrounding it. The house was built 2.5 years ago. The owners ‘wanted a simple but special house.’ There was an existing building on the site when they bought it that they thought that they might want to keep it but they weren’t sure. They asked Asa and she said’, ‘the Swedish way is to keep the old’ and so they did. The original house is the smaller volume of the building on the right-hand side. It provides an extra living space, two bedrooms and small kitchen and a bathroom. Dermot’s final stop is Gothenberg, an hour’s flight west of Stockholm to see ‘Villa at Amundon’. It was designed by Gert Wingårdh who is considered Sweden’s most renowned living architect having designed many of Sweden’s most important buildings. Built in 2000 for a private client, Villa at Amundon was then bought by Plastic Surgeon Dr Fredrik Berne in 2015 as a home for himself and his three children. The house has a humble, low-key approach between two giant granite boulders. All you can see is the entrance door and a small portion of the building. It gives no hint of what is beyond. The entrance brings you straight down the stairs to the open plan area and the rear windows looking out to the sea. .This space is 7m high and 2 m wide. You descend to the axis of the pool and the mirroring of the sky captured in this vertical frame. The glass ceiling that runs the full length of the back of the house extends out over the back. It is completely horizontal with no inclination at all. This was a huge challenge and a something that Wingårdh was happy, and relieved to achieve.